Waterfowl hunting ranks high among hunter preferences across North America, and for hunters ready to extend their gunning after the end of the 60-day duck season, the U.S. Fish and Wildlife Service’s light goose conservation season, beginning in mid-February, is in order. 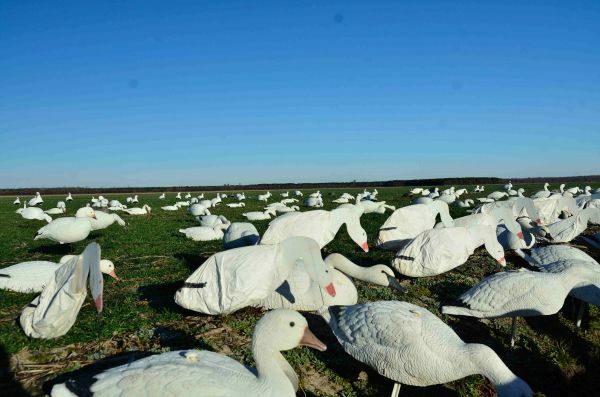 Anyone who has visited the northeastern corner of North Carolina during the winter is accustomed to seeing massive clouds of snow geese that monopolize growing wheat fields and fields of cut corn. With the conservation season authorized, hunters can finally “unload” their frustrations on these white cacklers by reducing the flock and alleviating pressure on winter crops, as well as the fragile breeding grounds in northern Canada. Populations of light geese continue to increase to levels that are causing extensive damage to the nesting grounds in the arctic and sub-arctic tundra breeding grounds. The conservation order, authorized by the Migratory Bird Treaty Act and regulated by the U.S. Fish and Wildlife Service, allows for a special hunting season after all other migratory bird season are closed. In addition, the order grants the use of liberal methods and unlimited harvest of light geese, including snow geese, blue geese and Ross’s geese between Feb. 13 and March 31. Hunters can use unplugged guns and electronic calls between a half-hour before sunrise and a half-hour after sunset. While light geese migrate into South Carolina’s coastal region on occasion, massive flocks of light geese routinely winter in a handful of counties across northeastern North Carolina. The best counties to look for light geese are: Dare, Hyde, Tyrrell, Washington, Chowan, Perquimans, Pasquotank, Camden and Currituck. The N.C. Wildlife Resources Commission requires all participants in the light goose conservation season to obtain a free permit and complete a harvest survey.